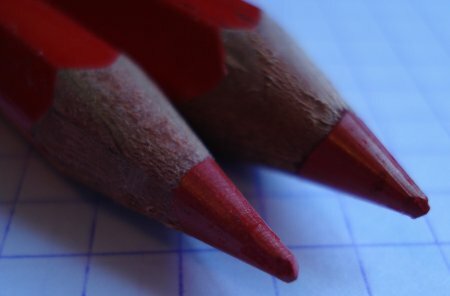 Must a successful pencil manufacturing business be part of a multinational conglomerate? Is there any room for smaller firms in the current marketplace? Many of us may not have heard of Viarco. They are a 94 year old pencil company from João da Madeira, Portugal, who produce a wide range of pencils – writing pencils, drawing pencils, carpenter’s pencils, and yes, even copying pencils and red and blue pencils – with a staff of twenty-eight! Their website is a breath of fresh air compared to many pencil industry sites, revealing considerable pride in their history, as well as many details about the pencil manufacturing process. Sample fact – graphite cores are baked at 1020ºC. I was really happy when Gunther kindly sent me a couple of Viarco’s red and blue pencils. The pencils are the 289 Viarco Comercial (regular size, hexagonal) and 293 Viarco Olimpico (oversize, hexagonal). 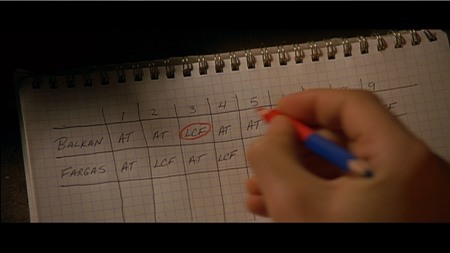 The lead centering isn’t the best. My first pleasant surprise was realized while attempting to sharpen the Comercial – it doesn’t fit in some sharpeners! It is the unreformed size of pencils that were made fifty years ago, though the edges are rounded, like modern pencils. Both the Comercial and Olimpico sharpened easily. I don’t know what wood they use, but it looks like cedar to me. The second surprise was the rich, vibrant marks they make. 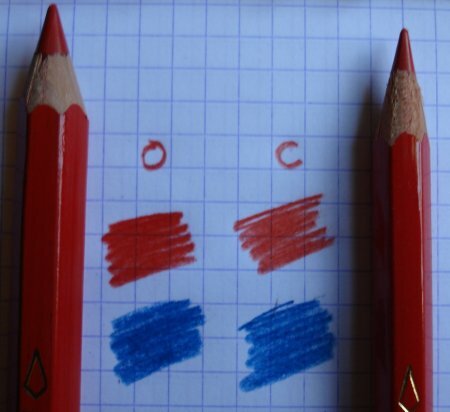 The Olimpico in particular is among the best of the red and blue pencils I’ve yet seen. The Comercial’s blue is also good, but the red is more of a red-orange. If I could buy them locally, I would get a huge stash of the Olimpico. It writes extremely well, and is very easy to use. 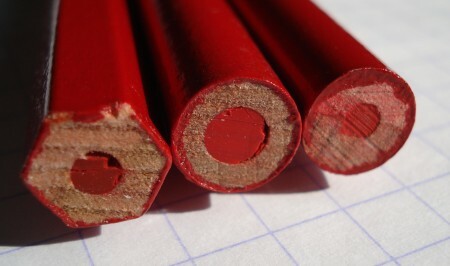 Some of the other red and blue pencils I’ve seen, like colour pencils in general, have a tendency for the leads to easily break – but not the Viarco pencils. I’ve tried to email Viarco more than once, and haven’t yet heard from them. That’s okay. With twenty-eight employees, I imagine that their correspondence staff might be busy in the paint booth, or be driving a forklift. So about our original questions – let’s hope there is still room for great smaller manufacturers like Viarco, who have done a great job with these pencils. 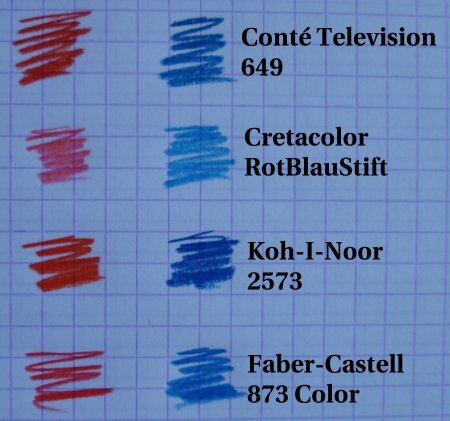 Well, I now have a Conté Television 649 red and blue pencil, as well as three other members of the elite red and blue pencil cadre. The pencils are the Television 649, made by Conté in France, the RotBlauStift 162 00 from Cretacolor, made in Austria, a Koh-I-Noor 3423, origin unstated, and a Castell 873 Color by Faber-Castell, made in Germany. 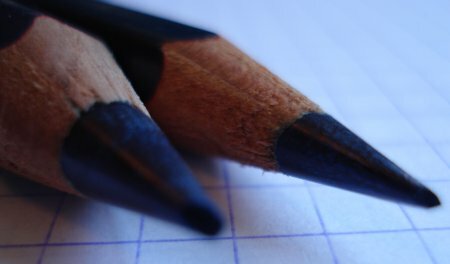 The RotBlauStift is a regular sized hexagonal pencil, while the other three are oversized hexagonal pencils. – Faber-Castell is definitely the rebel here, eschewing the standard red and blue for their signature forest green. I wish they hadn’t done this. There are occasions when respecting a tradition should trump branding concerns. – The Koh-I-Noor has exceptionally utilitarian markings, with the name imprinted via something akin to a dot matrix printer. – The Television’s wood has the same sort of look as the Grip 2001 pencil – jelutong or pulai. 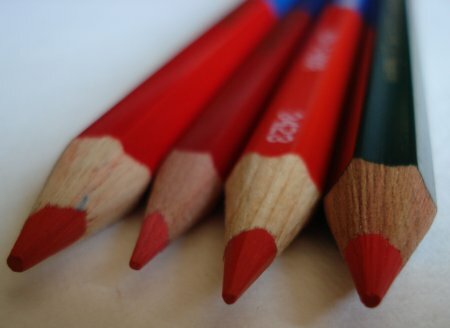 As with our previously examined red and blue pencils, there is a range of colours – the Cretaclor is light in both red and blue, the Koh-I-Noor bright and rich in both, and the others somewhere in between. These traditional pencils associated with teaching and accounting still have a strong resonance. While the keyboard has supplanted pens and pencils in many areas, it is fascinating that this sub-specialty of the woodcase pencil still continues. All of these pencils shown are in active production by their manufacturers. 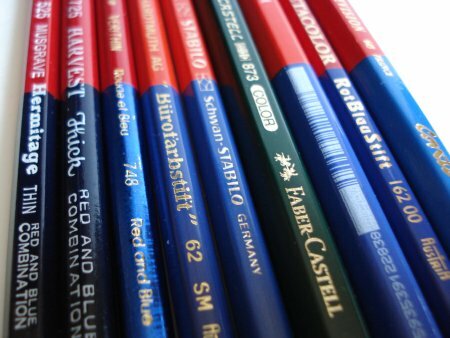 This page at stdk.de, which has documentary quality photographs of several red and blue pencils, plus a list of known red and blue pencils in production. With thanks to Gunther, I now have two more red and blue pencils. The new pencils are the Koh-I-Noor Hardmuth AG “Bürofarbstift” 62 SM, made in Austria, and the 8742 Stabilo Schwan-Stabilo, made in Germany. On the blue side, the Bürofarbstift 62 uses a lighter shade. 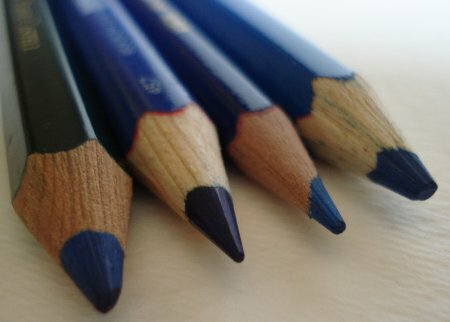 The other four pencils offer very similar dark blues. The red choices show more variation, with each vendor offering something different. 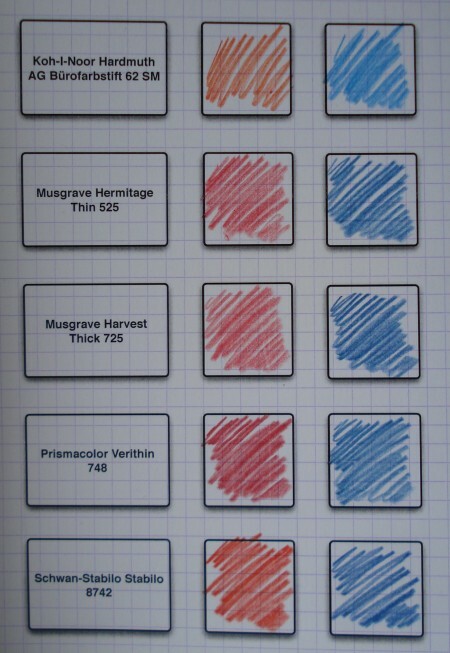 Both European pencils makes lines that are more on the orange side, while the Musgraves offer a subdued red, and Verithin, a richer, more vibrant red. While accounting, school, and editorial uses for this pencil may be traditional, I can imagine many other functions, including U.S. political consultants using these to plot on electoral maps. 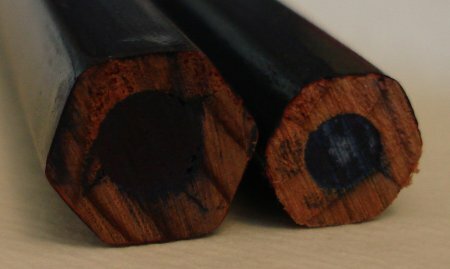 The “Thin” and “Thick” labels of the Musgrave refer to the pencil cores – not the pencil diameter. The shape is the externally distinguishing feature – the Hermitage is hexagonal, while the Harvest is round. The Prismacolor pencil is also round. 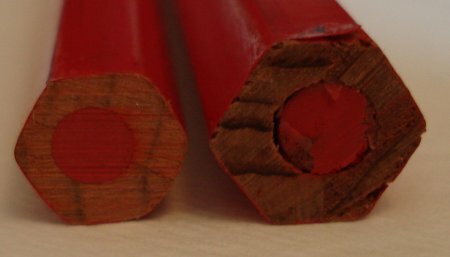 While attempting sharpening, I found the leads of both Musgrave pencils to repeatedly break in a variety of sharpeners – especially the red ends. The Hermitage in particular seemed extremely averse to sharpeners. The Prismacolor pencil had no such problems. As pencils, each had merits – the Prismacolor had the richest and most vibrant colours – so it would be the best on a blank sheet – yet the lighter and more muted tones of the Musgraves might be better for correction on a printed page. In appearance, these pencils are a great blast from the past, and both Musgraves having great styled details. The Prismacolor has a serious presentation issue – the blue end appears to be a type of foil on top of the red varnish. Since the pencil shipped with a bar code sticker on the blue end, the foil now looks extremely dated and tattered. Almost like the fallen disco ball on that bad remake of the Poseiden Adventure. Despite some issues, I think the Prismacolor Verithin is the best of the lot – reliable sharpening, and rich vibrant colour.